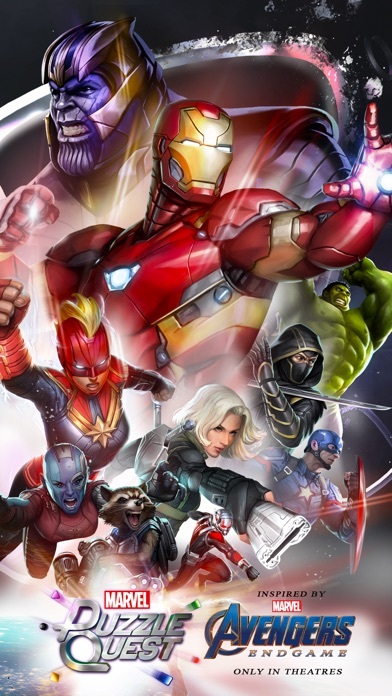 Marvel Comics Super Heroes come to life in this Official Marvel Match 3 role playing game! Create your own epic Dream Team using the strongest Super Heroes and the nastiest Super Villains in the Marvel Universe! Play characters like Spider-Man, Captain America, Wolverine and the Hulk as you battle your way to victory. Thor, Iron Man, Deadpool and others await! Assemble your team and get ready for the fight! 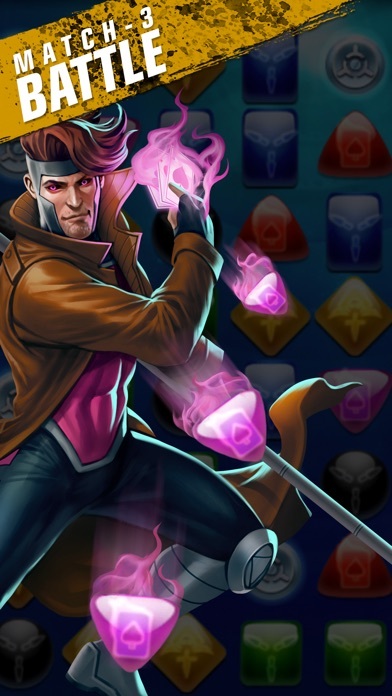 9.1 out of 10 “An intricately crafted, remarkably deep experience -- Marvel Puzzle Quest doesn’t merely meet the expectations of its name, it exceeds them.” - IGN.com (Editors’ Choice Award) FEATURES • Join a community of 15 million players worldwide! • Collect and upgrade your favorite MARVEL Super Heroes and Super Villains! 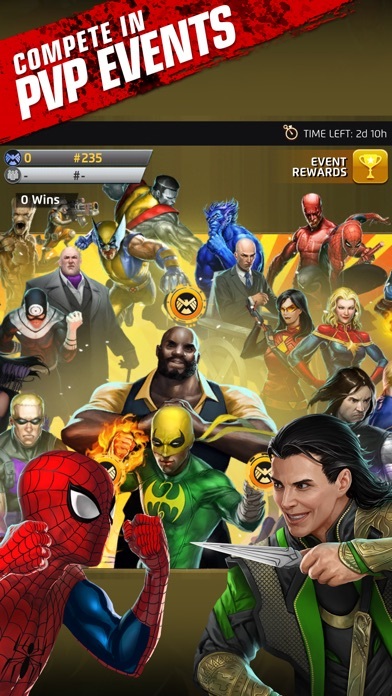 • Form alliances with your friends and use your collective power to fight other players in events and epic battles via chat • Build strategic alliances with your favorite heroes and villains • Challenge your team of Super Heroes in exciting Player vs. Player Tournaments • Snag the top rank in Tournaments, Alliances, and Season Play for new character rewards and other prizes! • New events, features and tournaments direct from the Marvel Universe • Exclusively written by Marvel’s Frank Tieri (Iron Man, Wolverine, Weapon X) and Alex Irvine (Iron Man: The Rapture, Daredevil Noir) THE ORIGINAL MATCH 3 SUPER HERO GAME! Match tiles to annihilate your opponents, harnessing Hulk’s superpower strength or Professor X’s mind control to manipulate the game board! Match 3 gems in a row to power up, damage and bring even the most powerful Marvel Comics characters to their knees. Will you be able to rank among the top champions? PLAY WITH MARVEL’S GREATEST HEROES AND VILLAINS Recruit your favorite Super Hero characters from X-Men, Avengers, S.H.I.E.L.D., Guardians of the Galaxy and more to create the ultimate Marvel dream team! Whether you play Spider-Man alongside his arch-nemesis Venom, or play Captain Marvel alongside her Ms. Marvel successor, Kamala Khan, YOU assemble your very own epic team of Marvel Comics Super Heroes! Play Captain Marvel and her infamous fists against your fiercest foes or launch Captain America’s shield to stun your opponents in the final contest. 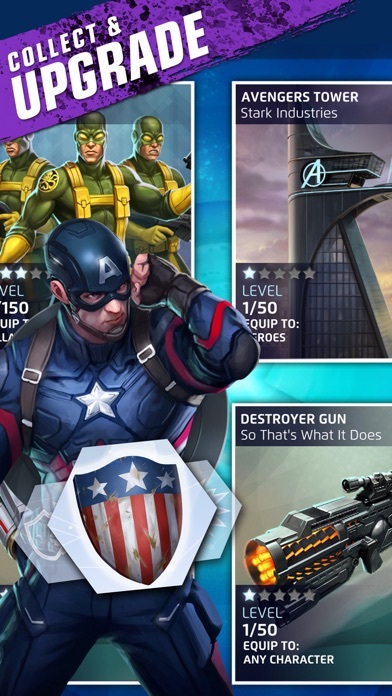 MARVEL Puzzle Quest’s ever-growing list of Super Hero comics and movie characters is updated regularly including Black Panther, Ant-Man, Daredevil, Hela, Talos, and more! 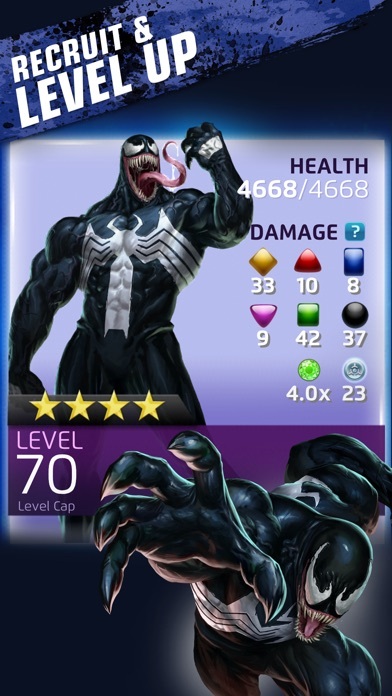 UPGRADE YOUR CHAMPIONS AND GAIN POWERFUL REWARDS Harness the power of Iso-8 to upgrade your Super Hero Dream Team and collect comics to unlock Marvel characters and new superpowers. A USA Today “10 Great Games” Pick! 4 out of 5 stars from Touch Arcade! ■ Like us on Facebook: www.facebook.com/MarvelPuzzleQuest ■ Subscribe on YouTube: www.youtube.com/MarvelPuzzleQuestGame ■ Follow us on Twitter: www.twitter.com/MarvelPuzzle ■ Follow us on Instagram: www.instagram.com/MarvelPuzzleQuest INSTALL MPQ TO UNLEASH YOUR INNER SUPER HERO AND BECOME PART OF THE MARVEL UNIVERSE! App is available in English, French, Italian, German, Spanish, Japanese, and Korean. Developed by Demiurge Studios © 2019 MARVEL GAME SOFTWARE © 2019 D3 Go! Marvel and puzzles, what’s not to like! Love the game, the only problem is the difficulty involved in getting commander points.5 star characters are far out of our reach.coins are also too expensive. Need more good deals. "I'll fight for it," I can take out a 5 star with my 2 star if I win , the character is mine , if I lose I will forfeit my coins or commander points. "Let's race for pink slips". I hope this helps. Rudy. *** 4/16/2019 UPDATE *** Developers got back to me regarding my last update, which at least shows that they do read reviews. The only bone of contention is their statement that “Regarding your thoughts on the opponent A.I., we can confirm that the A.I. opponent is not given any advantage to their odds of receiving a cascade; however, we understand that it can certainly feel this way at times, and we will be sure to discuss your thoughts on this matter with the rest of the team“. This response is empty when you consider a noticeable pattern in the game. I won’t sit here and hash out all that I’ve seen as it would take too long. I will simply restate that I understand and accept the business model of apps such as these: higher difficulty = player purchases to keep up and progress = $$$ for the developers. I’m just suggesting that there could be a better balance between profitability and player experience/enjoyment. Most recent update has taken away healing abilities used prior to the end of each battle....before, you could heal your team to full health before the battle ended....now, whatever you healed is taken away after the battle is over....not a great update at all Updated review *** 01/21/2019 *** While I still play the game daily and enjoy it, there is much improvement needed by the programmers with regard to the game’s A.I. I read a developer response denying the suspicion that the opposing team gains more AP than the player. While this is true, and both teams gain AP equally, what is significantly unbalanced is the supposed “randomness” of the gems. Close examination will show a clear pattern of bias against the player. Examples are long chains of consecutive gem matches (which technically disproportionately increases the opposing team’s AP), match’s that prevent the player from building AP, conveniently timed matches by the computer after the player has built enough AP to utilize character abilities, etc. For example, the player will get the first move and make a single match, but when it’s the game’s turn, the game will make a match that begins a cascade of matches that almost immediately fills its AP. One of the matches will often be a 5-gem match, which allows the game’s turn to continue and allows the game to begin firing off character abilities and likely eliminating one of the player’s characters or almost eliminating them. And while I’m sure the developers will argue that the playing field is completely random, that is actually impossible considering that the app is programmed with numbers and algorithms. I understand the need to make the game challenging and encourage purchases by the players (this is obviously a for-profit app), the game would be more enjoyable and retain more players if the game was dialed back to challenging rather than impossible. If I am able to predict the computer’s next move 70% of the time or more, then there really isn’t much that’s random about the game, is there? Or if I burn through a full supply of health packs after less than 5 battles in under 15 minutes, that would be considered at least slightly unfair, wouldn’t it? My recommendation to the game’s developers is to avoid sacrificing your players’ enjoyment for the sake of profit. Don’t reduce the level of fun just for a few extra bucks. Love this app but I’m wondering if it’s going to take a century for them to explain it to me. I’m annoyed that I have to listen to 20 minutes of how to play it but whatever. I love the game, been playing it for years, solid work. Previously I wrote a review on some 4 star characters being used more than others, which was rapidly fixed, which impressed me. Now the only thing I would like looked at is being able to see the patch notes from the App Store or app itself after every new update. Going to the website to check is not something I really think of doing. I’d also still love to be able to do something with ISO-8 aside from levels. There’s no motivation for long-term players who have built up a supply from playing so often. You spend it occasionally, but you gain 10x more than you spend, unless you’re just starting out. I know finding exactly what to do will be difficult, which is why I still give the app 4 stars. Keep up the good work! Super fun to play and I play it all the time. My only issue preventing me from giving 5 stars is that the character draws seem a little unbalanced I blew twenty recruit tokens and got like the same three characters a million times. I think that needs fixed, or we need to be able to heart two star characters. As far as free to play games go, this is probably one of the best. Yeah thanks for helping with lost data thanks for nothing!